The Rays are in the World Series. An entire team with a smaller payroll than the left side of the Yankee infield (Jeter & A-Rod) will represent the American League in the 2008 World Series. A franchise that once played an occasional home game at Disney's Wild World of Sports, in order to attract fans, is hosting games 1 & 2 from St. Petersburgh, Florida. Cow bells, fraudulent fans, and a team with more promising talent than the cast of Stand By Me, will play in the World Series. How else can I put it? The Tampa Bay Rays are in the FREAKING' World Series. Nearly two weeks ago, every baseball mind in America, was picking Sox v. Dodgers in the Series'. A Series with all the drama in the world. Manny's return to Boston, Torre to face the team that destroyed his dynasty, the script couldn't have been better. Then, Cole Hamels of the Philadelphia Phillies, and of course Matt Garza of the Tampa Bay Rays, decided to edit that script. Their re-write? Worst to first vs. a city searching for a championship team, their first since 1983. Philadelphia v. Tampa Bay, and were off. 1. By the time the World Series kicks off, the Phillies will have had seven full days off. The 2007 National League Champs, the Colorado Rockies, had a record 8 days off before Game 1 of the World Series, they got swept by the Red Sox. The 2006 Detroit Tigers had 6 days off before their Game 1, then were promptly dismissed by the Cardinals in 5 games. If anyone is upset with the Red Sox dramatics, pushing the ALCS to a seventh game; it's Philadelphia. 2. The Rays are THE story of 2008. The worst record in the majors in 2007, years of 100-loss seasons, a franchise destined for door mat status. Then, they pretty much take the American League East from wire-to-wire. Drop the Chicago White Sox in 4 games of the ALDS, and beat the Boston Red Sox in a Game 7, a game the Red Sox have become accustomed to dominating. After years of drafting the countries elite talent, in 2008 the Rays finally put it together. As the Cardinals were welcomed to the Red Sox coming out party in 2004, is it possible that the Phillies are a mere invite to the 08' Fall Classic? 3. I don't know of another example where the road team benefits, but when Tampa Bay arrives in Philadelphia for games 3,4, and 5, they may be the first. The Rays have just set an LCS record with 15 home runs. Led by young stars Evan Longoria (6 postseason homers) and B.J. Upton (7 postseason homers) the Rays would be entering a ball park, Citizens Bank Park in Philly, that has seen more homers fly out than any park this side of Coors Field. Not a good sign for the Phillies, who have yet to see their slugger, Ryan Howard (48 homers in the regular season) go yard in the postseason. Now it isn't all bad for the Phillies, they do have some things looking up for them. Like the fact that pitcher, Cole Hamels, has been nothing short of stifling in the postseason. The Phillie southpaw is 3-0 in October play with an era under 1.25. He's struck out 22 batters in as many innings pitched. The key for Hamels, he's allowed only 6 walks in those three starts, keep Rays off base, keep the game in hand. 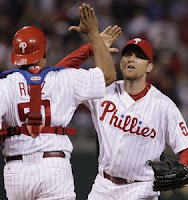 Phillies closer, Brad Lidge, has converted every single save opportunity in the regular season, and the postseason. In seven and a third innings pitched this postseason, he's struck out ten batters and allowed just one earned run. Over the regular season, opposing 2,3,and 4 hitters have hit just .175 against Lidge, that would be Tampa's Upton, Pena, and Longoria. Lastly, Lidge isn't the only Phillie who shuts the door on opposing lineups. Reliever, Ryan Madson, has been dominating in the postseason. Madson has gone nine innings allowing just one run in the playoffs. He's struck out six batters and walked only one in his relief of Phillies starters. More importantly, he's become that ever important bridge to the closer. If you can pencil in Hamels for seven innings, have a lock down guy for the eigth, and bring in a dominate closer, it makes the game real simple. How do the Rays complete their miracle run? Lock all these young kids up for the next six years and see what happens. Oh, in regards to 2008? 1. Don't lose serve at home. In game 1 your going to see probably the best starter you've seen this postseason, Cole Hamels. He can get in a groove quickly and it's difficult for teams to knock him out of that groove. Jump on Hamels early and quiet the Phillies. If the Phillies are putting him down for three starts and hopefully at least two wins, knock him out early and take control of the series. My point? MAKE BRETT MYERS BEAT YOU IN GAME 2. Between Shields, Garza, and Kazmir, the Rays will put a starter on the mound that can go toe to toe with any starter the National League has to offer, more importantly, any starter the Phillies have to offer. 2. Your closer is rookie, David Price, at least for 2008. Let's be real for a second, not just anyone can come out and slam the door on the Boston Red Sox, in a game seven, WITH BASES LOADED. The kid can pitch and pitch hard, he's got unexplored Major League talent and is a force to be reckoned with. Price is your closer, not Dan Wheeler, J.P. Howell, Chad Bradford, or Grant Balfour. Prices' VERY young major league career has looked promising (14 innings, 12 k's) and the person who knows most about this is manager Joe Maddon. Again, you don't put this rook in that spot last night without knowing he can do it. David Price, welcome to the big leagues, and the World Series. 3. If you get the opportunity to end this thing, END IT. The only time the Boston Red Sox got to your starters and chased them early, was Kazmir in Game 2. Luckily, their starter looked just as soft in that game. If you get Hamels or Myers on the ropes, put them away. If you get up 3-1 in a series, win game 5. If your pitcher is putting the ball in Ryan Howards wheel house, give him the hook. Howard, much like David Ortiz, can only strike out so much before you leave one for him, and he leaves the yard one you!